One of London’s most exclusive electric string groups with saxophone can provide background music or a choreographed show with saxophone for your event. Playing first, glamour is the added extra. 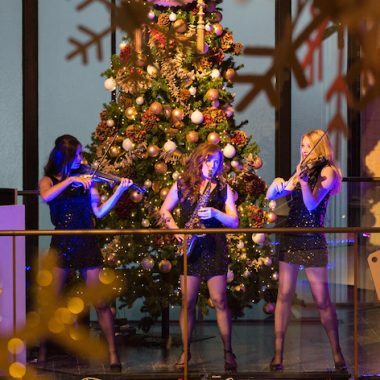 This female string group with saxophone plays a mix of classical, pop and tango music, inspired by the likes of Vitamin String Quartet, Bond Electric String Quartet and Electric Violinist Vanessa Mae. Paving their own way in the world of classical crossover music they have created their own choreographed show taking you on a journey from the famous Bach Tocatta and Fugue and Palladio to Sahara Tango and Happy by Pharrell. A string trio with soprano saxophone, set up by saxophonist Sarah Louise Ings in October 2007. Collectively trained at the Guildhall School of Music and Drama and the Royal Academy of Music, this group is a music sensation not to be missed. They perform a mix of tangos and classical crossover music, alongside other popular songs written and produced by Sarah Louise Ings. The Electric Strings With Saxophone are known for thinking outside the box. Over the years they have evolved to bring their fans and corporate event bookers many different sides to their performances allowing them to perform as a string ensemble with saxophone, high impact choreographed string show and rehearsed DJ Club set performing re mixes of their tango and other popular club hits. The girls success has seen them open the Rugby League Season at DW Stadium in front of 18,000, Perform for the opening of Harvey Nichols in Kuwait, been the face of Walk the Walk for Breast Cancer, open the Harrods Sale and toured worldwide headlining on cruise ships across the world. Individually the girls have performed with Olly Murs, Cheryl Cole, Robbie Williams, Muse and Gary Barlow. March 2009 saw the release of their music video on Classic FM TV and now they are due to release their EP with Rupert Christie, producer for Karl Jenkins and Universal records to name a few. Their Tango is now featured on a Ballroom Compilation CD. Electric String Quartet Shows are a popular act to hire in London for product launches, corporate events, weddings and private parties. The added dimension of the saxophone brings another element to this show with something for everyone to enjoy. They perform a high impact electric string show made up of electric violin duo and female saxophonist. 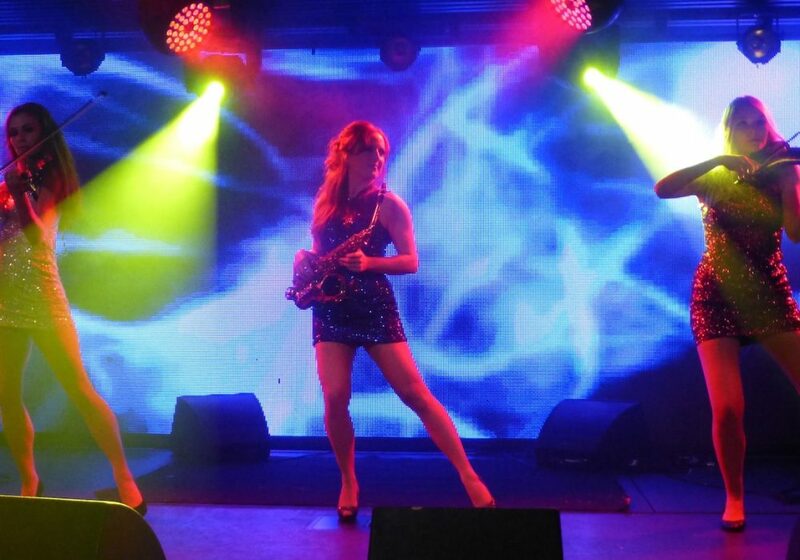 A choreographed show with virtuosic electric violin playing intertwined with compelling dance choreography. The Electric Strings with Saxophone are taking the string quartet right up to date with live technology by combining live musicians with DJ. This is a fun pre rehearsed DJ show with violin and saxophone performing live alongside DJ. The girls will perform current chart hits and improvise with the DJ. This is a really fun alternative to your traditional string quartet, hire the DJ Live Set as a show or as an after party, partying alongside the saxophonist and Electric Violinist. 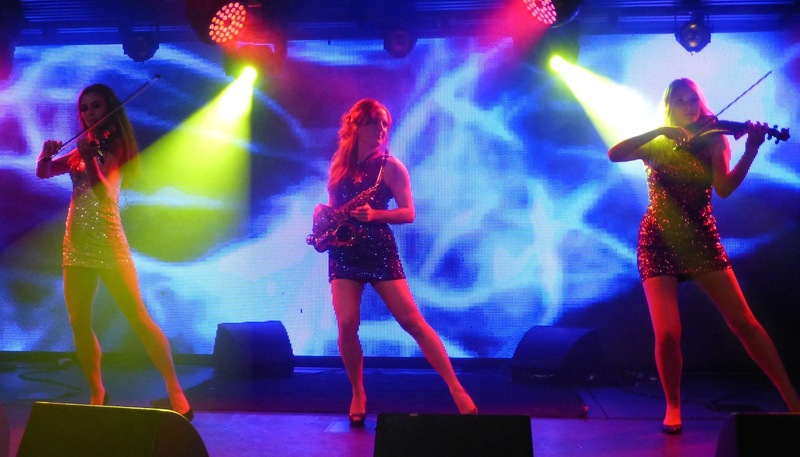 Electric Violin Players and Female Saxophonists are extremely popular musicians to hire improvising alongside a DJ. These girls love to party, their rehearsed DJ LIVE set is a perfect act to hire for high profile corporate events and private parties in London and Europe.